La Bauhinia’s menu reflects both French and Southeast Asian cuisines. 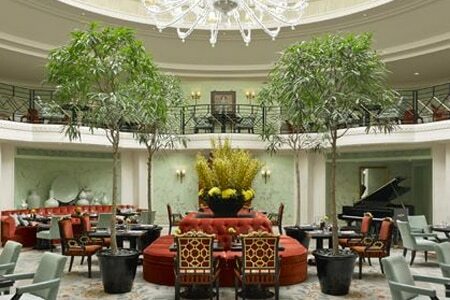 : La Bauhinia, which takes its name from the flower known as “Hong Kong orchid,” is part of the dining trio at the Shangri-La Hotel, Paris, along with L'Abeille and Shang Palace. The restaurant serves breakfast, lunch and dinner, as well as afternoon tea and weekend brunch. The menu reflects both French and Southeast Asian cuisines. Refinement and luxury pervade the room, decked out with Chinese vases, a glass roof and a huge Murano chandelier. On Saturday and Sunday, from 11:30 a.m. to 3:30 p.m., a generous brunch is offered, showcasing topnotch ingredients (€92 with a fruit juice or €110 with a glass of wine or Champagne). Items include a royale of foie gras, a pomelos and shrimps salad seasoned with vinaigrette, makis, Spanish ham, scrambled eggs with sausages, and oysters. Follow with an assortment of cheeses and one of the tantalizing desserts from pastry chef Michaël Bartocetti, a fruit salad, a vanilla flan or mango rice.